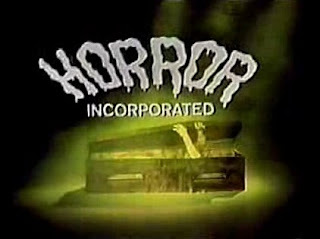 Horror Incorporated was a horror movie show without a host that aired in Minneapolis, Minnesota on KSTP-TV, Channel 5 in the early 1970s on Saturday nights. Jim Wise did the opening and closing narration. The person in the coffin was floor director Warner Smithers. Forrest Stanford ran the fog machine. Lurking among the corpses are the body-snatchers, plotting their next venture into the graveyard....the blood in your veins will run cold, your spine will tingle when you join us for an excursion through Horror Incorporated! Loved these old classic monster movies, They need to come back!